Unfortunately, potholes are a common occurrence throughout the Chicago area, and in the rural countryside of Illinois. Inclement weather and typical wear and tear on the roadway can create potholes when the road's top layer of asphalt wears away to expose the base below. Once a small pothole is created, rainwater accelerates the process and can quickly increase its size when the damaged is repeatedly driven over. With the extensive rainstorms, ice storms, and melting snow in Illinois, it is no wonder why pothole accidents in Chicago happen so often. All year long, car, truck, motorcycle, scooter and bicycle commuters complain about the dangerous craters, holes, and pits in roadway surfaces in rural and urban areas. The weather conditions of late winter and early spring are especially susceptible at creating potholes when roadways, sidewalks, parking lots and private roads routinely experience the freeze/thaw cycle. A small pit or crack in the surface can absorb water over time. When the absorbed water freezes, it expands the small crack, increasing its size. When the water thaws, it allows the absorption of more water, which then freezes, expanding the hole even further. Without immediate attention, the freeze/thaw cycle and daily traffic can quickly increase the pothole size, making the damaged area extremely hazardous to travelers. Chicago and the surrounding metropolitan area are not without their major potholes problems. This is because many roads have been neglected for far too long. In an effort to alert the public of neighborhood potholes, the Chicago mayor’s office, in early 2014, began providing an online “pothole tracker” managed by the Department of Transportation. Motorist can view an updated list of pothole repair requests, the date the pothole was filled and the road repaired. Unfortunately, the tracker does not contain a list of every existing pothole, which can still lead to serious accidents involving extensive damage and injuries. Even a small pothole can cause significant damage to a motor vehicle and put a huge strain on its suspension and shock absorbers. A large hole in the roadway can actually cause damage similar to a car being involved in a 35 mile an hour accident. Even with ongoing roadway construction and pothole repair throughout Illinois, there is a significant rise in the number of motorists experiencing a car accident in a pothole during every season of the year. A pothole accident often occurs when the vehicle travels over a large pothole and responds to the intense blow. The unexpected, sudden impact can cause the motorist to quickly lose control of the vehicle, which leads to an accident involving serious injuries. When traveling at a high rate of speed, the car can be thrown easily into another lane traveling in the same direction or in the opposite direction, placing everyone in the vehicle at great risk of harm. Chicago and surrounding municipalities are legally bound to repair and maintain proper highways and roadways, and ensure they are free of any defect or damage. However, the liability of any car accident caused by a pothole can be extremely challenging to determine. Attorneys must prove legal liability by showing how the municipality or city had knowledge of a defect/damage, or should have had the knowledge, but failed in their abilities to remedy the dangerous roadway condition. In other situations where a driver causes a collision when attempting to maneuver around a pothole, a claim may be pursued against the driver who caused the collision. 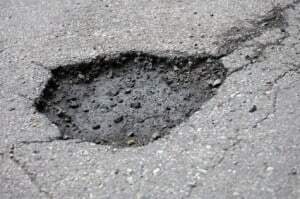 Even in circumstances where a driver claims that they had no choice but to drive around a pothole, a claim for financial compensation can generally be asserted against them for their failure to keep a proper lookout of dangers in the roadway. It is often best to use the skills of an experienced attorney when filing a claim against an Illinois municipality in a pothole car accident case. Often, the location of pothole will determine if it is the county or the city is legally responsible. Once legal responsibility of the appropriate government entity has been determined, the attorney will then need to prove that the city or county had knowledge or should have had knowledge of the pothole but took no action to correct the problem. Rosenfeld Injury Lawyers LLC understand the best legal approaches to a pothole car accident case. Our attorneys can establish negligence by the appropriate government entity and develop an effective strategy to receive financial compensation for our client to recover compensation for the property damage and injuries involved. The lawyers can sort out at-fault liability, damage recovery, insurance claims, and the amount of appropriate compensation deserved by all victims of the accident we represent. Consult with Rosenfeld Injury Lawyers LLC at (888) 424-5757 or fill out our online contact form before attempting to file a pothole claim against any government entity. Our attorneys can protect your rights and ensure you receive fair compensation for the damages, pain, suffering and injuries you endured as a result of a neglected pothole or irresponsible driver who contributed to your an accident.